Tommy is correct. I had a '60 Fury that I bought for 500 bucks when I was in college in '65. What a car! The only problem I had with it was that the D button on the pushbutton transmission would sometimes go all the way in and fall behind the dash. I had to keep a screwdriver handy to take the panel off and retrieve the button. I drove it for two years until I bought my first new car, a "67 Barracuda Formula S. I wish I still had it! Christine was an excellent movie. The only sad thing about it was that they Totally DESTROYED at least 7 1958 Furys to make it. Collectors were up in arms even then way back 18 years ago. 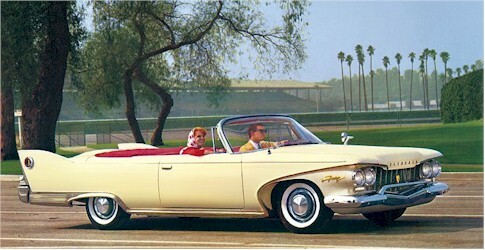 The Stephen King novel "Christine" featured a '58 Plymouth Fury. The movie version car looked similar to this one.